The Ironmen Honour Roll was established in 2006 to honour players, coaches, managers or builders who have contributed to the Ironmen tradition. Over the years names have been added to the wall with a special ceremony , usually between games of a doubleheader.. Family and friends of the honourees are in attendance which makes it a day to remember. A committee was put together to decide on honourees for each year. The first year saw three people have their names placed on the wall, Billy Daley and Cuffy McLaughlin as players and Joe Cook as coach and manager. Wally Jimmo (2006) Wally ventured to Chatham from to Escuminac and started his career with the Ironmen as a 15 year old in 1953. He had a very distinguished career and was capable of playing multiple positions. However he is best know for his pitching prowess and using his brains along with his “stuff” he became a big game pitcher. In 1976 Wally defeated Fredericton 4-2 at Ironmen Field with a two hitter in the deciding game of the provincial championships. Tom Dunn (2007) Tom was a driving force as manager of the Ironmen in the late 60’s and early 70’s. Tom was a dependable and tireless force working on upgrading Ironmen Field and expanding the Ironmen program. Ray Royce (2008) “Rolls” as he was called is considered to be the greatest import to wear an Ironmen uniform.. He came to the Ironmen in 1974 and immediately led them to the Senior Championship. In the final series, Ray pitched all seven games against Fredericton including a 3-0 victory in Game 7.. Ray and his family are constant visitors to the Miramichi and the Ironmen to this day. Willie Jardine (2009) A Chatham baseball legend, Willie is renowned as a great player and competitor. Among Willie’s attributes were his ability as a left-handed shortstop and as a baseball innovator. Willie coached minor baseball and the Senior Ironmen after he retired. Jason Dickson (2010) Jason is best known as the local boy who went all the way to the big leagues and was a member of the American League All-Star Team in 1997 . He starred for the Ironmen for 7 years and was the winning pitcher for Canada when they defeated the US to advance to the Gold Medal game where they captured the World Junior Baseball Champioship in Brandon Manitoba in 1991. Daryl Mathews (2010) “Daryl Mathew’s involvement with the Chatham Ironmen baseball team dates back you his year’s as a ball boy in the late 1960s. Eventually, Daryl became an assistant coach, with the team and, in 1991 he became General Manager , a post he has held for 24 (Editor’s Change) seasons.. During those years Daryl managed all aspects of Ironmen baseball: field renovations, fund raising , equipment needs, and transportation. 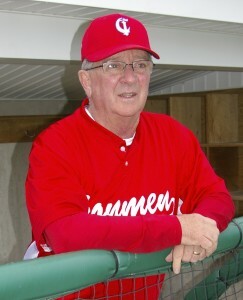 Daryl’s ‘ efforts were an integral part of the Ironmen’s quest to be awarded the 1995 Canadian Senior Baseball Championship Tournament.” ” Daryl’s leadership has led to numerous upgardes to the field in preparation for the 2011 National Championship Tournament” -Miramichi Sports Wall Of Fame inductee 2011. Ken Martin (2013) Marty joined the Ironmen in 1974. He played shortstop and third base and carried a huge offensive load as the Ironmen began their great streak in the 70’s. Marty displayed a strong throwing arm and hit for average and power in the middle of the order during his Ironmen tenure. he was a fan and player favorite as he made a big contribution to the Ironmen success. Marven McCarthy (2014) Marven made a great contribution to the Ironmen in many ways. As team manager he became known as a man who took on many tasks effectively. The National Tournaments Marven chaired were very successful as viewed by the community and travelling teams. In addition to his Ironmen contribution, Marven has done much for minor sports in the community. Eric Despres (2015) An Ironmen regular on the `95 National Championship Team,Eric`s finest hour was when he hit two home runs in our semi final win against Ontario. Eric, who broke in as a catcher and finished his career as a short stop, possessed great hands and a strong arm. Primarily a lead off hitter, Eric scored 290 runs, drove in 162, hit 26 home runs and stole 56 bases in a great Ironmen career. Terry Leggatt (2015) Terry has been an Ironmen all his life. His 17 year playing career included a 1991 highlight year where he went 6-0 with a league leading 1.58 ERA. He threw a no hitter in 1992 and was a league all star in 1991 and 1997. Terry played or coached in 8 National Championships where he won bronze, silver and gold medals. Twenty years ago this weekend, Terry pitched the exciting 4-3 comeback win over PEI on our way to Championship Sunday. As much as any player, Terry has contributed vastly to the Ironmen lore with his wit, his personality and his enjoyment of the game. George Lloyd (2016) George’s involvement with Ironmen baseball dates back to 1970.He and Ken Cripps formed an executive to start the Junior Ironmen.. He was instrumental in the construction of the original Ironmen clubhouse, installation of lights (1974) and the first scoreboard (1993). In 1989 he was one of the main driving forces in the re-birth of the Senior Ironmen serving on the executive ,being treasurer for many years, He provided excellent leadership to those volunteers who worked hard to revive the program. Matt Jenkins (2016) Matt is one of the greatest players in Ironmen history .He played 17 years with the Ironmen and starred as a pitcher and shortstop while carrying a big bat. He has the most wins in Ironmen history with 58 and strikeouts with 711. Offensively he ranks in the top 10 of Ironmen offensive stats in 6 of 10 categories. Matt batted 481 in 1999 and lead the league with 13 HR’s. When the Ironmen hosted Nationals in 2011, Matt beat Windsor Ont. 2-1 in one of the greatest games ever played at Ironmen Field in front of 3000 fans. 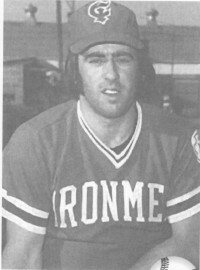 Kevin Keith ( 2017) Kevin played for the Ironmen from 1978 to 1984. He is in the Top 10 in all 7 offensive categories for the team and finished with a 401 batting average. He holds the season record for average (504) and hits (57). Dean (Dino) Gallant (2017) Dean finished his 8 year Ironmen career (94-01) with a 414 average, tops on the team. He is also ranked in the top 10 in three other categories.